Thank you for believing and investing in Healing Justice!!! cheré (rere) suzette bergeron + Rowan Emmanuel are 2 disabled, queer, non-binary, herbalists, witches, bodyworkers, doulas, community organizers, and healers who co-founded Herbalists for Racial Justice in July 2016. We will be spending 6 months holding space for a group of folks to learn + grow in intentional community + right relationship to the plants + to one another in service of collective liberation. Mmhmm yes! 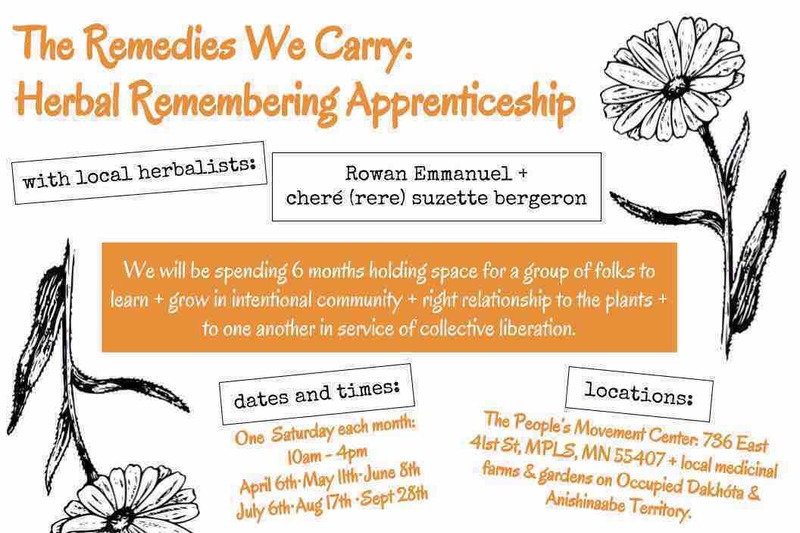 We will be supporting our apprentices in crafting their home apothecaries as well as collectively making medicine together for Herbalists for Racial Justice. We were originally planning to offer only 3 QTBIPOC scholarships, but after reading all of the wonderful applications we have decided to offer 3 full scholarships as well as 5 partial scholarships in order to put together a cohort that is majority QTBIPOC (11/13). We are accepting 13 apprentices & majority of them (7) will be receiving a scholarship. This is our attempt to radically subvert the dominant (white, cis, heteronormative, culturally-appropriative) paradigms of herbalism teaching + training. In order for us to make this happen, we need our communities to support us in this endeavor! This is a great opportunity for any white, cis, hetero, able-bodied accomplices to show us their support with your financial contribution! Or for anyone who wants to support community-based healing justice in action. ✨Center gratitude, reverence & reciprocity to the First Peoples of this land: Dakhóta, Anishinaabe, and other displaced relatives to which we are guests on this stolen land. ✨Honor and hold sacred our lineages as queer, nonbinary, neurodivergent, crip, herbalists, witches, healers, magick-makers, and future ancestors. ✨Share our gifts and our knowledge as we have been asked to by our communities from a place of humbleness and gratitude, locating ourselves as people who know some things about herbal medicine, and also as people who don’t know everything about herbal medicine. ✨Offer opportunities for shifting and deepening relationships between plants and people in service of reclaiming and breathing in right relationship with the ecosystems around us, below us, above us, and beyond us. ✨Uplift the sacred knowledge flowing around us, within us and through us as we are brought together to learn from each other, respectfully, with open hearts & minds rooted in disability justice. ✨Center the needs, desires, experiences, and histories of marginalized communities, paying respect to those who have kept traditional herbal healing alive + continue to do so in the face of genocide and forced assimilation. ✨Create access to herbal medicine learning / remembering circles with our hearts orientated towards collective liberation and while deconstructing the white supremacy, ablism, and cisheteropatriarchy within us and around us in hopes of transforming future of herbalism. We recognize that these types of spaces are actively repressed, policed and hard to come by amid the ways in which power + resources are held and enacted within western herbalism. ✨Craft a fluid, abundant container of wonder, humble curiosity and learning in hopes of fostering more care, more justice, more love, more reciprocity, and more magick for all of the people all of the time. Rowan Emmanuel (they / then) is an indigenous mixed, Xicanx/SWANA, queer, non-binary community herbalist, facilitator, healer and organizer. Their healing work focuses on trauma, healing, resistance, remembering and resilience. Plants have been tender friends throughout their life & has been a fiercely tender focus, learning and practice for the last 7 years. Rowan has been learning with and sharing skillshares with community for the last 3 years. When not working, they are off listening to and smiling with the elements and ancestors around us, growing food/medicine or chilling with their animals and friends. cheré (rere) suzette bergeron (they / them) is descended from cajun, norwegian, german, bohemian, & roma farmers, caretakers, healers, blacksmiths, merchants, & nurses. They are a trans, non-binary, queer, femme, crip, herbalist, bodyworker, traiteux (traditional cajun healer), & southern transplant. They spent their childhood in New Orleans, Louisiana (Chickasaw Territory) & their adolescence in Chippewa Falls, Wisconsin (Menominee & Anishinaabe Territories). Learn more about them + their practice, Sasssafras Healing Arts, here. Update: As of 4/1/2019 we have reached our original goal! We are still raising funds as more costs have come in than we anticipated. Additionally, 11% of our proceeds from the GoFundMe will be donated to the following beneficiaries: Divine Natural Ancestry and Mashkiikii Gitigan. Thank you for believing and investing in Healing Justice!!! We love you!! !